The customer called after receiving iPad, and had a similar message error message as to the ones above. something in the lines of “iCloud Backup Has Not Been Performed In 2 Weeks”. Customer said his only option was to click “Ok” which he did and iPad would turn off, black screen. Hold the Sleep (On/Off) & Home button down (together) for about 10-12 seconds. Restart your iPad by pressing and holding the home button and sleep (on/off) down together until the device shuts off and the Apple Logo appears. Once the Logo appears let go of the buttons. Wait 1-2 minutes for the software and home screen to load up. Once the iCloud error lockup has been cleared make sure to do a manual backup on iCloud. On iOS 8.1 go to “Settings” > “iCloud > then on right side click “Backup” (below “Notes, Safari” etc listings) > then click “Backup Now”. Enter your Apple password if prompt. 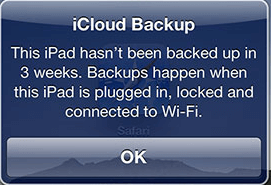 Seems to be MANY experiencing this “iCloud Backup” message and iPad lockup. This article is receiving MANY views, and searches lately per day with the same general search terms and iCloud lockup problem. Apple needs to somehow “patch” that, just because a backup was not done, the iPad should NOT be locking itself up like that. I had a icloud back up reminder message that wouldn’t go away and consequently locked my whole iPad. The suggestion above to hold the home and sleep button for 10 seconds or until the apple logo came on worked. Thanks, much appreciated ! Your welcome, and glad it worked for you! Your welcome, and thank you. It worked!! Thank you so much!! Your welcome. Apple needs to somehow patch that, it shouldn’t be locking up the iPads like that. Thanks for the help. I was able to clear this message. Fab. This worked for me. Thanks so much! Thanks for posting this solution-it worked! Thanks for commenting, and you are welcome! So, it’s not an uncommon issue. I thought Apple has all the experts in their store. Thanks again for posting this solution. Hi! It’s so good for you to come up with this website. i have the same issue with My ipad mini. Unfortunately, even after Pressing the button for more than 20 seconds it doesn’t do any good on my end, The scen suddenly just turn black ut the logo does not show up and if you press the botton, you would see the error message again. It’s pretty annoying and I hope you can help me on this. Thanks. Make sure you are pressing – holding down BOTH Home and Sleep/Power buttons together, at the same time. Approximately 10-12 seconds. Screen will go black (ipads restarting), release both buttons when you see the Apple logo. it worked. Thank you. But I got the captcha code wrong twice. Last try. How ridiculous I can’t believe it just locks up like that! The message about being backed up just wouldn’t go away and I couldn’t turn it off! Well this worked for me so thank you very much! It worked for me! Just now. Thanks a lot. Thanks so much for that advice!!!! !